Learn how to improve your English pronunciation and sound like native speakers in episode 14 of the Power Learning Podcast! In Episode 14, we finish month 11 of the fluency journey of our Master English Conversation Scholarship Contest winners, discuss how to sound like native speakers and finally reveal the progress of one of the winners! Listen to hear the great progress of Jaroslava, one of our fantastic members from the Czech Republic, and discover one of my best tips for improving your English pronunciation in 3 simple steps. Well, hello, and welcome to episode 14 of the englishanyone.com Power Learning Podcast. I’m Drew Badger, the Co-Founder of englishanyone.com, I’m an author, and an English speaking confidence expert, and it is a pleasure to welcome you to another episode. We’ve got actually a lot to go into. I’m really excited about this…I’m always, well, I guess, excited about every lesson, and every podcast I make, but this one in particular, because I get to reveal the before and after, uh, of one of the Master English Conversation Scholarship Contest winners. So I’m really excited about that, and we’ll also get to talk about pronunciation as well. The other thing also I want to talk about is the stages of fluency that you’ll be going through, so we’ll talk a little bit about the kinds of things you’ll learn and the order you should learn them in, but then also the phases that you’ll go through as you make a transition from being a non-native speaker to a really strong, confident, fluent speaker, with great pronunciation. The first thing I want to talk about is the stages of fluency, and this will help you kind of figure out where you are, and figure out what’s coming next, and what you’ll need to do to improve faster. The first part of this explanation with be talking about the way that you should be learning, and then the second part of this explanation I will talk a bit more about, uh, the phases that you’ll be going through. So usually the first thing that you should be doing is mastering grammar. And the reason you master grammar first, is because if you can’t, uh, actually speak properly, it doesn’t matter how good your pronunciation is. You know, you can speak with fantastic English, and I say this all the time to students, you can have a beautiful voice and pronounce words perfectly, but if you make simple mistakes in your grammar, they become even more noticeable. So native speakers, if you’re having conversations with them, uh, we say that sticks out like a sore thumb. So a sore thumb becomes bright red, it’s painful, so the little mistakes that you make become even more obvious to a native speaker. So we’re always, uh, just like a baby, uh, we should be learning first the grammar. And it doesn’t mean you have to study grammar rules. You know, I teach plenty of ways that help students master grammar automatically and naturally without having to try to learn rules, uh, even though it might be useful to know the names of some rules so you can look them up to learn more. But the most important thing is to master grammar first. And then, while you’re doing that, you’re beginning to learn more native words and phrases, the kinds of things that you find in conversational English. And working closer and closer to becoming fluent, uh, you will finally work on your pronunciation kind of at the end. 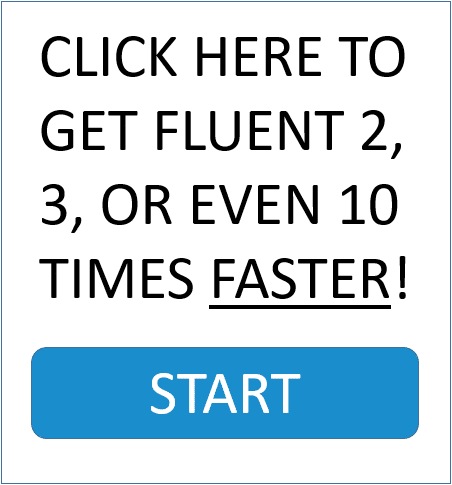 So as you really begin to speak more quickly, and you can use your grammar and make sentences without thinking, and effectively, that’s when you can really begin to focus on pronunciation and really take your fluency to the highest level. So the things you should be learning, again, first master grammar, and then, as you’re learning more words and phrases, and building confidence, then you can really start to enjoy more native content, like movies, uh, music, things like that, uh, and that will help you improve your pronunciation. 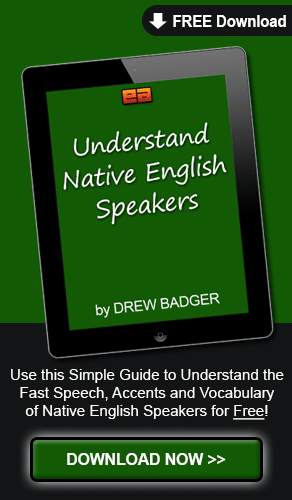 A lot of the pronunciation practice comes from listening to examples of native English speakers talking. So just like me, or other native speakers, or watching movies, things like that, you will learn the way native speakers speak, but you won’t be able to understand what they’re saying until you’ve learned the phrases and the idioms and all of those other pieces first. So that’s why the pronunciation is the last thing that you’ll be working on. So thinking about the phases of fluency, what you’ll be kind of going through first, as your…you know, right now your level is pretty good if you can understand this podcast, so you’ve gone through the phases of mastering kind of written, uh, English, you know, you know, a lot of grammar rules, you can read and write well. Uh, the phase after that is learning to master the conversational English that native speakers actually speak. So if you’re at that phase right now, uh, right now the most, uh, important thing you should be doing is learning lots of phrases and idioms, uh, and slowly listening to, uh, real…real English that you’d find in, you know, movies and things like that. Uh, and then as you’re doing those, then you will finally move into the last phase of fluency, which is working on your pronunciation. And if you can do that, uh, and kind of relax and see how you work through the phases, if you know how they will be happening, and the order they’ll be happening in, you’ll be able to work through them much faster. So think about all these things as you’re working through your own fluency, and think about where you are. Uh, and also remember that that’s exactly why, over the course of these podcasts, I’ve been, uh, kind of moving from the most basic things that you need to master, all the way up to the most specific things that you get as you work through these phases of fluency. And I’ve done that because this, uh, latest set of podcast episodes has been following the progress of the four winners of the Master English Conversation Scholarship. And so I’ve gotten, uh, recordings from them each month, I get to listen to them practice, and recently I’ve had conversations, actual Skype conversations with a few of them, and I plan on having some more. Uh, and the transitions that people are making is just amazing. So I will reveal one of those today. We’ve started with the Master English Conversation Scholarship almost a year ago, so we’re in the end, uh, of month 11, and there is one more month to go. So it’s very exciting. We’re finally reaching the end, even though, obviously, you never stop learning because there is always new things to learn, always, uh, new phrases and idioms being created. So as long as you continue to study, you will always know what’s being spoken. So we began almost a year ago talking about grammar and the general things that help you learn, but now we’re getting to the end of the year, so we’re into pronunciation. Now, before I reveal that pronunciation tip, I’ll be talking about that at the end of this podcast, I wanted to talk more about one of the Master English Conversation Scholarship Contest winners. Uh, and this is Jaroslava, this is a…a fantastic woman from the Czech Republic, and she’s been working every single month, going through the program, and sending me her recordings each month to document her progress, and I’m really excited, um, by what she’s done. Now, she’s done a fantastic job not only because she’s studied and she’s continued to work each month, uh…and that can be, uh, you know, a great achievement in and of itself, where you, uh, you focus on something and you continue to stay with it. Because, you know, learning a language can be tough. Uh, and even if you’re talented and have a lot of resources, it can still be challenging to learn. Sometimes, uh, you know, for myself, there’s some phrases I like feel, ah, I just can’t seem to remember it, or like a grammar point doesn’t make sense to me logically, so it’s hard to understand it when I’m learning Japanese. So Jaroslava, number one, has continued each and every month, learning the program, and sending me recordings. But the other thing that I’m really impressed with is that she has, without having anyone else, uh, around her to practice with, she’s been able to, uh, have really great improvement working through those stages of fluency that I mentioned before. So I will, again, reveal the kind of before from about maybe a year ago when she sent me her very first recording, uh, and then I will play the conversation that she and I had. I will play part of it, it’s kind of too long to play the whole thing, uh, but I will play a part of that conversation for you in this episode, so you can see the difference that she’s made. She began with, uh, just kind of basic, you know, I am this, you are that. Uh, this is, you know, the most basic form of English grammar, uh, so she couldn’t really speak confidently. But now, she’s actually able to work through the higher…higher levels, uh, or the kind of later phases of fluency. So that’s what I’m really excited about. Her pronunciation still isn’t perfect, but now that she’s mastered the basic things, and her kind of fluency and mind are ready to start doing the pronunciation work that really takes you to the next level of your fluency, and really gets you to that native level where people will wonder if you’re a native speaker or not. And it is possible to get there, if you really want to, but it’s just important to take these things in steps. So when you listen to her before recording, and then you compare it with how she is now, uh, it really shows that by using the program and actually working through the lessons each month, and continuing to practice, doing the homework assignments, no matter where you live in the world, you can still become a great speaker, even if there aren’t other people around you to practice with. So, right now, sit back, and listen to a few seconds of her from the original recording she sent me one year ago. Jaroslava:	Hello. How are you? I am fine, thank you. Uh, I am woman, um…I am, uh, 41 years old. I am married. I have, uh, two sons. [Marken ?] is 13. Mike is 8. I am electrical engineer. I use computer for my work. Okay, so that was her recording from over one year ago. Now, I’m going to play the recording that she and I had from a Skype conversation a little over a week ago. Uh, so I was really excited just to hear her speaking, uh, and even though she still has a long way to go, we all do. So just the grammar and the phrases that she’s mastered so far, I think she’s done a really fantastic job. So listen to this actual conversation. There’s no script, she’s not reading anything, we don’t have a plan for this, I’m just asking her questions, and we’re just having a nice conversation. Enjoy. Drew:	So how do you…how do you feel now? Tell me about your confidence? How is it different from when you began the program, uh, versus now? Jaroslava:	I feel fantastic. I can…I can speak with you now. Drew:	Yeah. Are…are you able to think more in your head in English, and you’re thinking, uh, less in your native language when you speak? Jaroslava:	Uh, I think in English. Uh, I don’t [inaudible 00:11:04]. And, uh, when I see a movie, I, uh, don’t like when it’s, um, uh, translate to Czech. Better for me is, uh, just listen in English. Drew:	Oh, that’s fantastic. And I remember you’ve told me some stories about, uh, like recently you were on a vacation, and you got to speak with some other, uh, people from a different country, but it was in English. Can you tell me about that story on the boat? Jaroslava:	Uh, yes, it was a fantastic, uh, week, when I spent with my family. Uh, I was, uh, able to rent a [sail jag ? ], um, and when we had a small technical problem, uh, I was able to solve it with operator on the phone. And other people have asked, uh, I can speak with them. Drew:	I see. Well, I…I think…Yeah, I think you’re, again, I…I’m, uh, I’m…I’m speechless. Uh, do you have any last words or anything that you’d like to tell for other people that are learning out there around the world? What would you like to say to them? Jaroslava:	Uh, I can recommend, uh, your course, because, um, uh, I never [inaudible 00:12:17] that I will be, uh, speak, uh…like, uh…like today. Uh, I am very, uh, happy, uh, that I can see movie, and I understand, uh, and I can speak, um…I…I learn only 11 months. It’s fantastic. Drew:	Well, I look forward to…yeah, it’s…it’s just amazing, uh, and I really thank you for…for taking the time to do this recording with me. Uh, so I will say goodbye, so, uh, if you want to say bye-bye to everyone, and then we will finish the recording for today. Jaroslava:	Bye-bye. See you again. All right, well, I hope you enjoyed that, and could hear the difference in not only, uh, her grammar, and her speed, and her just fluency, and her ability to respond quickly without thinking when I was asking her questions, uh, but her confidence as well. Even though she was really nervous, you know, this was her first time she was speaking with me. She’s been in the program and watching my videos each month, but this is the first time she’s actually getting to have a conversation with me. So I was really excited about that. And the interesting thing, uh, again, is that she doesn’t have anyone to practice with, so she just sits around, you know, listening to me, or, you know, the other, uh, speakers that come into the program, uh, and just practices. A little bit each day, a little bit each month, and you continue to see a lot of progress. So, Jaroslava, I’m really, really proud of you, and really excited about what you’ve done, and uh, really looking forward to hearing you in the future as you continue. Well, uh, we will move on, because we have still, uh, you know, two more months to go, basically. We’re finishing this month and then we have the next month for the winners of the Master English Conversation Scholarship Contest. And I wanted to give a tip as we’re getting to the very end now, about pronunciation. I know a lot of people want to sound like native speakers, and it’s really, uh, an important thing for many people. So I want to talk about kind of a different way to practice which doesn’t require much speaking. It’s more about training your mind. Now, this is a tip that it works, uh, not just for pronunciation but for anything else. Right now, I’d like you please to just close your eyes, uh, and, you know, you can kind of imagine, uh, a cityscape, or you’re, you know, walking around downtown in some big city. There are cars driving by, and buses, there are loud noises, and people walking and talking, uh, very tall buildings. You look up and you can see, uh, it’s even hard to see the sky, there are so many tall buildings that are covering the view. All of the things that you see in that scene, everything, from the, uh, the little…the tiny little streets that you’re walking on, or, uh, the little flowers that have been planted, uh, everything that you see, everything, everything, everything, including the people, everything that you’re looking at, began as an idea in the mind of a person. Now, this is a really interesting thing, and a really important thing to remember, because, uh, no matter how big or how small an idea is, it must begin as an idea, and then become a real thing after that. So everything that you’re looking at, you can kind of open your eyes now and look around your room, you know, maybe even the computer that you’re looking at, or if you’re listening to this on your…your phone, every physical thing that you see in this world, and a lot of the ideas, even, that you have in your mind, they came from other people. And every single one of those things, both the physical and the ideas, they began as an idea. So all of the things that we see, um, they’re kind of created twice. And this is a…a common thing that you’ll hear, um, you know, for, you know, learning to, uh, improve languages, or to improve, you know, business, uh, any kind of skill that you’re learning like that. A lot of mental training is reunited, uh, especially for sports. Uh, I remember a study that was done for basketball players where they…they took, uh, a few groups of people, they split them into three groups, I believe. Uh, one was, um, uh, trying to shoot the free throw, so they would actually go to the gym and train to shoot free throws. Uh, and another they would just sit and think and try to visualize shooting the free throws. And, you know, they took both of these groups, uh, there might’ve even been a third one, I don’t remember the exact study, but basically, uh, the group that just did the visualization, they actually showed a lot of improvement. And the reason for this, again, is because, you know, your mind doesn’t really know the difference between what’s real and what’s not, especially what you’re kind of telling it what to think. So not only, uh, the things that you create, like a physical idea that you have, like, uh, coming up with a truck, or something like that, and then you produce that physical truck, uh, or an idea about how you believe your, you know, your physical confidence is, or your body, or something like that. That’s why, you know, mental diseases where you tell yourself that you’re too thin, or you’re too fat, they become real, so that’s why you have to be careful, uh, not only the things that you create in your mind that become things in the real world, but also the way you think about yourself. So, uh, think, uh, thinking about all these things, keeping this in mind, the really cool way that I like to practice my pronunciation is kind of three steps. Uh, and the first one is, you know, you can take a movie, uh, and watch somebody else speaking. Or you can, you know, watch me in a video, or anybody else, it doesn’t really matter, but take that video and watch it many, many times to help you, uh, be able to kind of play that video back in your mind. So let’s say you’re watching, uh, like Will Smith, uh, in like “Men in Black”, or something like that. So he is, uh, you know, fighting an alien in that movie, and you can see that the image is already created for you on, uh, like a video screen. So you watch that a few times, uh, and you see him using some phrases or words, whatever that phrase is, uh, or that situation is. And once you’ve seen that enough times, you kind of imprint it onto your own mind. And if you take that imprint, and you kind of show that movie again of Will Smith, uh, speaking in a certain way, uh, kind of replaying that movie scene back in your mind, you can really start to train your mind to copy the way he speaks. So you kind of are, again, doing the…I guess kind of the best way to describe it would be you practice the pronunciation of something first in your head, and then that way that will kind of train your muscles in your mind that you can really start seeing more improvement faster when you actually speak. But the best way to begin this process is, especially if you’re not familiar with it, watch other people in movies and things like that first, so that you can practice playing those movies back in your mind. Now, what I’m able to do, because I really like mimicking people, uh, is I could take a character in a movie and then put him into my own mind, and have him say things, uh, in his voice, uh, or her voice, that, uh, they didn’t actually say in the movie. And then that skill is what will help you focus on improving your pronunciation. So, even before you try to, you know, copy what somebody else is doing, let’s say you’re watching a pronunciation video where a teacher is showing you how they move their mouth, instead of trying to copy them directly, what you should be doing is replay that person back in your head. Because when you can do that, then you’ll be able to visualize yourself doing the same thing. So, again, we’ve got these three steps. The first one is visualizing someone else doing something in your mind, the second step is visualizing yourself doing that thing, and then the third one is, you know, finally actually practicing that, uh, that motion in your…uh, in the real world. So you can do a lot of practicing by visualization, and that will also help you train your muscles in the same way that that kind of physical activity would. But the benefit of using your mind to practice is that you can do it any time you want to, it’s not bothering anyone, you don’t have to feel bad. Maybe you’re sitting on a bus or a plane, uh, close your eyes and just inside your head try to make up a story that I am telling, but you are the one actually creating the story with my voice. I know this sounds like kind of a tricky idea, but basically all we’re doing is using that principle of creating something first in your mind, and then creating it in the real world. So if you can see it in your mind, and really believe you can do that thing, then that’s what’s going to give you a lot of motivation and excitement to really push your pronunciation to the next level. So for all of our Master English Conversation Scholarship winners out there, and for you listening, for everyone, uh, get out there and, number one, you know, use the power of your mind to believe you can do it, uh, and tell that to yourself over and over again, but also use the power of your mind to practice. So practice in your head without even saying anything. You can even sit down and kind of, you know, maybe move your body a little bit, but you should be able to visualize yourself actually sitting there, uh, in your head and talking with someone. And the more you can do that, the more you can really practice your pronunciation and actually see kind of where it’s coming from, where…you know, where your tongue should be in your mouth, because you’re actually able to see and move somebody else that’s doing the same thing. So take the example from the real world, put it into your mind to practice, and then start using those things when you actually practice back in the real world. Well, I hope it’s been an excellent lesson for you. I’m really excited. We’re almost to the end, again, of the Master English Conversation Scholarship, but we will have lots of podcast episodes in the future, so I’m excited about those as well, where we’ll be talking about kind of different things. Uh, but especially if you have any questions or comments, or there’s more things that you’d like to learn about, uh, I produce this podcast for you. So if you have anything you’d like to know, let me know about it. Have a fantastic day, and we’ll see you next time. Bye bye.